Walked back to Silay and started B-3 line to straighten out some bends in line. Stayed with Humphreys. Rained hard during night. day. Move back to Manila to-morrow for a da yor two. about fifteen minutes before we could wake him up. left for Manila by lorcha (Chinese sailing vessel) in P.M.
we could get some more mail. Ran A-line down a road and through town. Farnham and Cooper got back from Carlota. Went out and ran on B-line back of town. Have got another sore on my leg. Fine day. class tax. Bacalod a fine place. No rain. Carlota. Fine day all day. Rainy and cold all day. Went out in morning but came in about ten. Transit party worked all day. Wrote a long letter to Ab. in P.M. Wimpluries over to dinner. Says they have a warrant out for Mr. Farnham's arrest in Manila for cutting cane. Drive to Bacalod to-morrow. Got up from our bamboo bed about 5 o'clock and started out to look for our truck. started on end of C-line to connect it up with D-line. Rained so came in early. Mr.
Ma and one from "Babs". First time I have had any mail for three weeks. turned in on the bamboo floor and got a little sleep. Felt kind of hungry though. level hacienda country all the way. Laid round camp all day. Wrote to Ma. No rain. telling when we will get any now. Rained in p.m.
shock in the morning. Rained hard in p.m..
had any mail for two weeks and a half. from Bacalod. Patsy and Worthington back. Roberts fired, Barber in his place. last week. Fine day all day. Worked on estimates about all day as they have to be in at once. Wrote a note to Ma. the island to Dumaguete through the mountains. Hope not. we moved our stuff out and slept on board the boat. In camp all day working on the estimate. Rained hard in morning and cloudy all day, getting into the rainy season in good shape. My leg pretty sore, a little afraid of blood poisoning. Due to leave here to-morrow. Went out alone in the morning and took some pictures with the company camera in the P.M. We went out and ran about a mile of line and got caught in the rain. Have got a big boil on my left leg sore as blazes. Finishing up around the terminal and guess we got finished up. Got into camp about three o'clock. Running lines at terminal for topography. Ran about three miles. Patsy's laid up. White ____ chaise. Hot all day. Labor day at home. In looking over some old Papers and records my attention was called to the fact that at the outbreak of the world's war 1918, manv people had trouble in establishing their citizenship, therefore it has occurred to me that I would be con-ferring a great favor on my family if I tell you something about your ancestors. You are descended from pioneer stock on your Mother's and Father's side of the family. Your Mother was of Noble French stock. Her people having fled from. France during the revolution or in the year 1815, settling in New York where her Father was born, being educated at the Harvard Medical College where he graduated. When he was twenty six years old he payed a visit to Cincinnati, there met her Mother and married in 1841 . Her Mother was English noble stock on both sides of her family, the Shepherds side consisted of four brothers settled in and about Cincinnati or what is known as the Miami valley, having purchased lands from Cincinnati to Dayton, Ohio. Later years three of the brothers left for England, leaving all their properties to Ova Florence Blanots Flye's Treat grand father and many of the shepherds descendants still live there, among them a grandson of Orlando Lincoln Flye and Eva Florence Blanot Flye, Harold Melbourne Flye. Her grandmother was Sarah Preston, born and raised in Boston, Mass., where she married Thomas Shepherd in 1884, who was educated at Harvard College. They left shortly after their marriage and moved to Cincinnati where his father gave him an estate near Ganoe, Ohio where they lived during their life time. A grandson still lives there. Preston Shepherd the second, they raised eight children, among them your mother's mother, Maria Jane Shepherd. My forefathers are English and Irish. 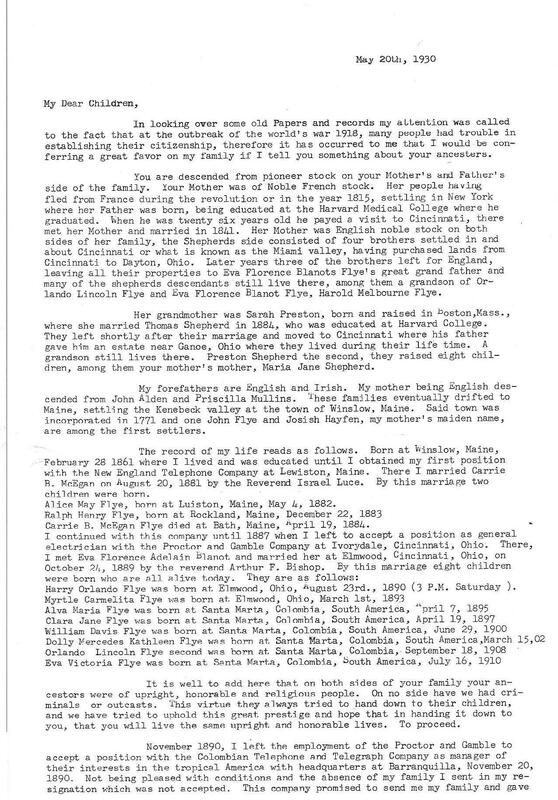 My mother being English descended from John Alden and Priscilla Mullins, These families eventually drifted to Maine, settling the Kenebeck valley at the town of Winslow, Maine. Said town was incorporated in 1771 and one John Flye and Josish Havfen, my mother's maiden name, are among the first settlers. Alice MAy Flye, horn at Luiston, Maine, May 4, 1882. Carrie R McEgan Flye died at Bath, Maine, April 19, 1884. Harry Orlando Flye was born At Elmwond, Ohio, August 23rd., 1890 (3 P.M. Saturday). It is well to add here that on both sides of your family your ancestors were upright. honorable and religious people. On no side have we had criminals or outcasts. This virtue they tried to hand down to their children, and we have tried to uphold this great prestige and hope that in handing it down to you, that you will live the some Upright and honorable lives. To proceed. me a very good salary with orders to extend their enterprise. I stayed on and in 1892 made a contract with the Colombian Government to establish at Santa Marta, a Colombian Electric Plant. I had found much wild coffee in and about the mountains around Santa Marta. On having some gathered and sent to New York I was told that it was of the very best quality and they wanted some thousands of bags each year. After getting the Electric Light Plant well established I resigned from the Company and on August 4, 1894 began my career as a coffee planter in the Sierra Nevada of Santa Marta. I first started out on the north slopes together with some Bogota friends. There I sold out and was soon persuaded to start again near some friends who had started in coffee shortly after we had. Five friends went in together. Myself being one denounced the plot on the south western slopes known at that time as the VALPARAISO lands. There I started in with my wife and family to make a coffee estate. Later on took in two partners, one of which we later on bought out and today the Santa Marta Coffee Company has bought out the other four first owners. This large denouncement has two Estates, one called Hacienda de Cincinnati and the other Isla Nieve. Here I have established our own Electric Light Plant and Telephone Plant and have all the modern conveniences that one can have in the United States with a most ideal climate as you all know. Mind it has not all been easy, and we have had many a hard year to pull through such as you are going through today, although with the help of a very loving and encouraging wife have an estate that is a credit to any country and I can wish my daughters no better recommendation that they make as good wives as their mother has been to me. May God be with you all and if at any time I find something worth adding to this, I shall continue. 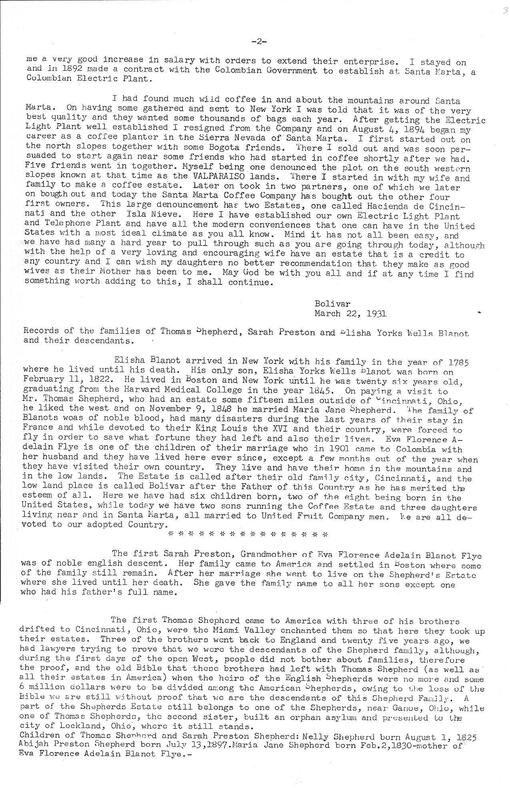 Records of the families of Thomas Shepherd, Sarah ah Preston and Elisha Yorks Wells Blanot and their descendants. Elisha Blanot arrived in New York with his family in the year of 1785 where he lived until his death. His only son, Elisha Yorks Wells Blanot was born on February 11, 1822. He lived in Boston and New York until he was twenty six years old, graduating from the Harvard Medical College in the year 1845. On paying a visit to Mr. Thomas Shepherd, who had an estate some fifteen miles outside of Cincinnati, Ohio, he liked the west and on November 9, 1848 he married Maria Jane Shepherd. The family of Blanots was of noble blood, had many disasters during the last years of their stay in France and while devoted to their King Louis the XVI and their country, were forced to fly in order to save what fortune they had left and also their lives. Eva Florence Adelain Flye is one of the children of their marriage who in 1901 came to Colombia with her husband and they have lived here ever since, except a few months out of the year when they have visited their own country. They live and have their home in the mountains and in the low lands. The Estate is called after their old family city, Cincinnati, and the low land place is called Bolivar after the Father of this Country as he has merited the esteem of all. Here we have had six children born, two of the eight being born in the United States, while today we have two sons running the Coffee Estate and three daughters living near and in Santa Marta, all married to United Fruit Company men. We are all devoted to our adopted Country. The first Sarah Preston, Grandmother of Eva Florence Adelain Blanot Flye was of noble english descent. Her family came to America and settled in Boston where some of the family still remain. After her marriage she went to live on the Shepherd's Estate where she lived until her death. She gave the family name to all her sons except one who had his father's full name. The first Thomas Shepherd came to America with three of his brothers drifted to Cincinnati Ohio, were the Miami Valley enchanted them so that here they took up their estates. Three of the brothers went back to England and twenty five years ago, we had lawyers trying to prove that we were the descendants of the Shepherd family, although, during the first days of the open West, people did not bother about families, therefore the proof, and the old Bible that those brothers had left with Thomas Shepherd (as well as all their estates in America) when the heirs of the English Shepherds were no more and some 6 million dollars were to be to be divided among the American Shepherds, owing to the loss of the Bible we are still without proof that we are the descendants of thi s Shepherd Family. A part of the Shepherds Estate still belongs to one of the Shepherds, near Ganoe, Ohio, while one of Thomas Shepherds, the second sister, built an orphan asylum and presented to the city of Lockland, Ohno, where it still stands. Children of Thomas Shepherd and Sarah Preston Shepherd: Nelly Shepherd born August 1, 1625 Abijah Preston Shepherd born July 13, 1897. Maria Jane Shepherd born Feb.2, 1830-mother of Eva Florence Adelain Blanot Flye.